Enhancing the military's ability to detect missile launches, supporting ballistic missile defence, expanding technical intelligence gathering and pumping up battlefield situational awareness, the Space Based Infrared System (SBIRS) Geosynchronous Earth Orbit (GEO) satellites play an important role in the nation's defense. The SBIRS GEO Flight 3 satellite undergoes final preparations at Lockheed Martin. To prepare for its launch, the satellite went through rigorous testing procedures, including thermal vacuum testing at the extreme hot and cold temperatures it will encounter in space. 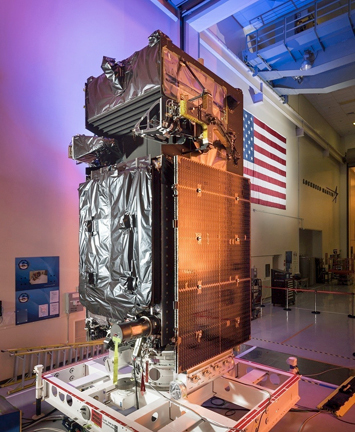 SBIRS GEO satellite (GEO Flight 3) is now settled in at Cape Canaveral AFS after delivery was completed on August 2nd by Lockheed Martin (NYSE: LMT) and the US Air Force for the October launch. SBIRS consists of a combo of on orbit satellites in GEO with hosted payloads in Highly Elliptical Orbit (HEO) as well as ground hardware and software. Lockheed Martin manufactured SBIRS GEO Flight 3 at its Sunnyvale, California, facility. For its trip to Florida, the satellite was loaded aboard a C-5 Galaxy aircraft at nearby Moffett Federal Air Field. It will launch aboard a United Launch Alliance Atlas V rocket. The next SBIRS satellite, GEO Flight 4, is in storage and will undergo final assembly, integration and test operations prior to a planned 2017 launch. SBIRS GEO-5 and GEO-6, which are currently in production, incorporate the modernized A2100 spacecraft to dramatically reduce costs and cycle times while increasing the potential to incorporate future, modernized sensor suites. The SBIRS development team is led by the Remote Sensing Systems Directorate at the US. Air Force Space and Missile Systems Center (SMC), Los Angeles Air Force Base, California. Lockheed Martin Space Systems, Sunnyvale, California, is the SBIRS prime contractor, with Northrop Grumman Aerospace Systems, Azusa, California, as the payload integrator. The 460th Space Wing, Buckley Air Force Base, Colorado, operates the SBIRS system. "SBIRS GEO satellites are our nation's missile warning sentinels and are critical assets to the U.S. military's continually evolving mission," said David Sheridan, the Vice President of Lockheed Martin's Overhead Persistent Infrared systems mission area. He added that with GEO Flight 3's successful testing and delivery to the launch site, the military's ability to receive timely, reliable and accurate missile warning and infrared surveillance information will definitely be expanded."